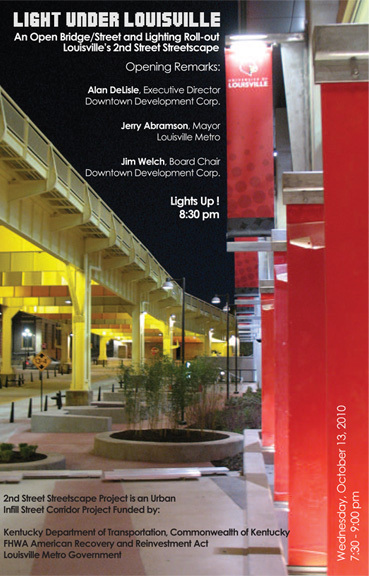 Less than one year after the contract was awarded, Light Projects’ illumination and color design for Louisville’s 2nd Street Bridge and Streetscape opened to celebrants on October 13, 2010. Officially named 2nd Street Transportation Project, the landscape architect was Carman and engineers HDR. Our client was Louisville’s Downtown Development Corporation (DDC). DDC and Carman navigated complex approval processes which included federal government agencies, State and City Department of Transportation, and the local Waterfront Development Corporation, among others. The project was funded by the ARRA stimulus program; which called for a fast track and economical design concept and solution. The streetscape area was a service road combined with adjacent vacant land running along side the George Rogers Clark Memorial Bridge. The cantilevered truss bridge, locally known as 2nd Street bridge, crosses the Ohio River between Kentucky and Indiana. The bridge is in the National Register of Historic Places. Cross streets Washington and Witherspoon join 2nd Street. A row of wooden buildings on Washington present their old timey “Whiskey Row” back doors to the street. The buildings of Iron Quarter on Washington are being renovated into hotels, restaurants and bars. When Light Projects arrived a generally disheveled, chipped and neglected sensibility pervaded. We visited the site and participated in a design charrette in November 2009.The stakeholder workshop set the tone and direction for the design. Bright and welcoming were the keywords for lighting. Now, the underside of the bridge is enhanced with a floating effect of cast light; outlining and illuminating the I-beam surfaces and textures. The duo-tone color scheme — red and gold — is balanced with the cream color of paint coating. The colors — bridge as canvas and the lighting — are based on a celebration of amber liquid bourbon and colors of sunset. Light Projects selected energy-saving fluorescent tubes for the bridge lighting – simple, industrial lighting fixtures with a twist; the luminaires were filtered with colored glass and controlled by Digital Addressable Lighting Interface (DALI). DALI is an electronic network protocol that is generally used for lighting in buildings. We adapted it for our exterior use and complex lighting sequences. Another technological innovation is a series of flasher beacons mounted on the face of the bridge. Whimsical sequences mark sunset and each hour afterward until 2:00 AM on weekends, and midnight during the week. These flashers are famous for lighting up the Eiffel Tower in Paris. Here, a little movie shot during programming that demonstrates the breathing sequence of color. Can you find your way at night? In the evening Washington D.C. NW is a monochromatic blend of light. The shifting interplay of nighttime dark and light make every city a unique destination. 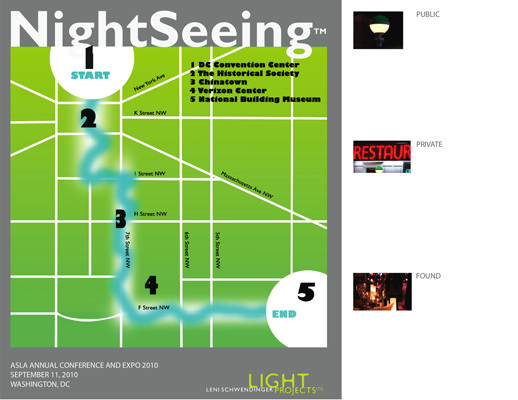 Join acclaimed lighting artist and designer Leni Schwendinger and a group limited to 35 as she presents impromptu the D.C. nocturnal city of light, culminating at the ASLA Gala. This mistress of light sculpture and installation will decode the shadows, emanations, and reflections that define the nightscape, from shop silhouettes to the phantom photons of passing cars. 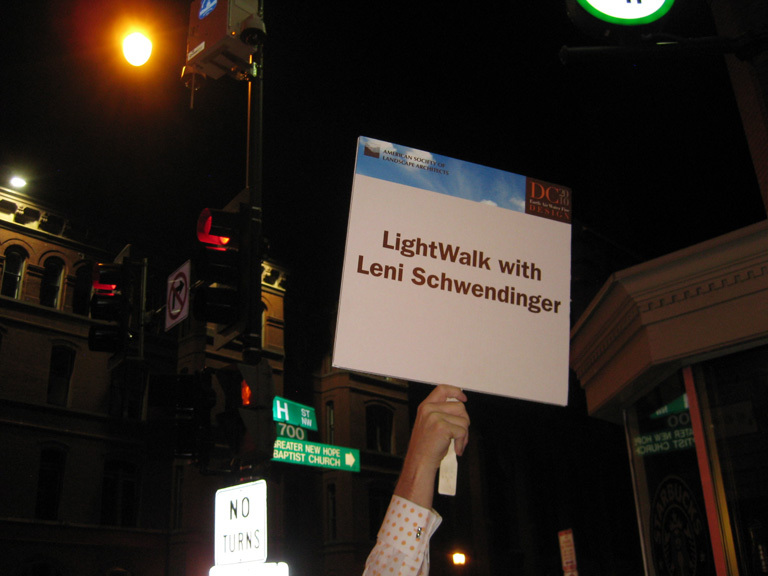 Saturday, September 11 7:45–8:30 pm, LightWalk with Leni Schwendinger –Sold Out! The NightSeeing™ LightWalk is conducted like a treasure hunt — a diverse group of participants searching for a fresh perception, a discovery of those lights and shadows, large and minute, to delight the mind and senses. Or rephrased for planners, designers and landscape architects; an analysis of the character of lighting in any given place. I began the tour with a quote from the artist/engineer/planner, Pierre Charles L’Enfant from September 11, 1789. On that date he wrote to President George Washington “to solicit the favor of being Employed in the Business” of designing the new capital city. His became a Baroque plan featuring open ceremonial spaces and oversized radial avenues with respect for the natural contours of the land. With my intrepid group — landscape architects, designers and manufacturers from all over the country — I sought L’Enfant’s plan, lighting detail and filigree, and found a soft undifferentiated layer of light. Public lighting — the lighting supplied by the municipality, business improvement district/CBD, utility, or institution in the United States — is generally “designed” by engineers and manufacturers. An increasing trend, however, is to incorporate lighting designers onto streetscape design and engineering teams to revitalize districts, neighborhoods and communities. City designs and plans, are strictly limited by regulations that are based on the primacy of the automobile (e.g. street lighting) and reducing risk , recommended brightness levels, maintenance and stocking issues, and the light pole and luminaire styles that manufacturers are currently marketing. On the positive side, this is the light that we can depend on – the base lighting that allows residents, workers and visitors to feel comfortable sallying forth into the city’s night. Public lighting is the threshold of light, upon which private and found lighting are layered. We started our journey focused on the Historical Society’s colonnaded edifice floodlighting. A traditional, uplighting method of frontal illumination, this approach results in soft ambient glow. Appropriate for classical buildings, and inexpensive. Onward past rows of historicist streetlight lanterns. Here, an effort could be made to differentiate street types and districts with varied types of poles, oh! a relief, the Chinatown lanterns with their red posts and lantern tops. We went through the Techworld canyon and surprisingly found the same decorative luminaires, rather than lighting fixture forms referencing forward-thinking technologies, although, there was one difference, induction lamps are being used — a source that is white light and has a long lamp life, requiring less maintenance. Some of the endearing details that we did find included count-down Walk/Don’t Walk signals, bracketed facade down-lights (cheap and easy), LED media signs and the colorful floodlit Chinatown gate. The most exciting part of the tour were the people on it and the acceptance of the D.C. residents and tourists milling about — the sidewalks were packed on 7th Street NW that evening. The small groups of loungers on the National Museum of American Art grand stairs were curious about the LightWalk and we in turn, discovered them using steps for the appropriate evening purpose… sitting in the floodlight of the stair and colonnade, a staple of light and architecture in our nation’s capital. 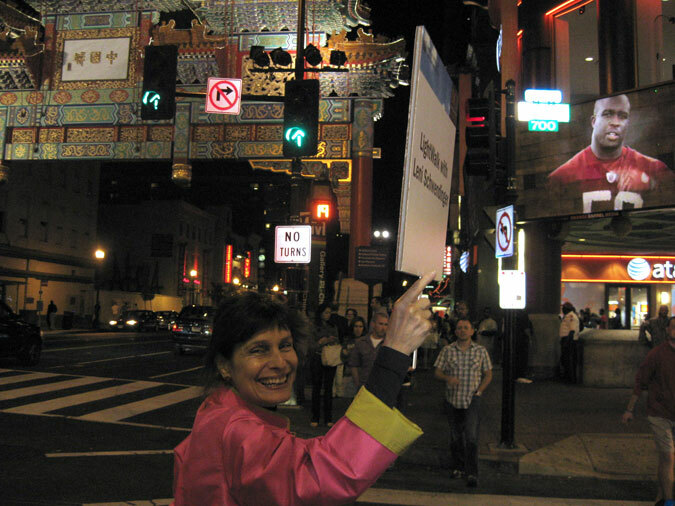 Leni Schwendinger’s LightWalk drew our members through the shadows of DC’s urban streetscape, guided by the eye of an artist and technician to experience the magical interplay of darkness and light. Skidmore Owings & Merrill selected to design first phase of work to convert Farley Post Office into a new train station. The project received $83.3 million in funds from the federal American Reinvestment and Recovery Act last month. Senator Daniel Patrick Moynihan first articulated his vision for a great new Penn Station in the landmark Farley Post Office building in the early 1990s. 1993: Amtrak unveils architectural plans for overhauling the Farley Post Office building into a grand new Penn Station, an idea first advanced by then-Senator Daniel Patrick Moynihan. The central court of the Farley building would be transformed into a new concourse for Amtrak intercity passengers. This plan is possible because the Postal Service has announced that it is moving mail-processing work out of that building. Brooklyn Academy of Music held their gala in the James A. Farley Post Office. I was commissioned to create a decor of light on the exterior of the colonnaded, grand staircase entry of architects McKim Mead and White’s building. Picture Research for "Public Dramas/Passionate Correspondents"
Public Dramas/Passionate Correspondents, a projection sequence of more than thirty glass slides and Mylar paintings, encompassed the two-block long classical facade of Manhattan’s main post-office. An exploration of the building and its role as a “civic stage”, the primary images were paintings of dense colorful theatre curtains – rising and falling, and expanding… ever opening… horizontally rotating around the columns and brushing the grand stair. Other images played in the six-minute montage; 30′ postal workers, a love letter, maps and mail sorting bags. 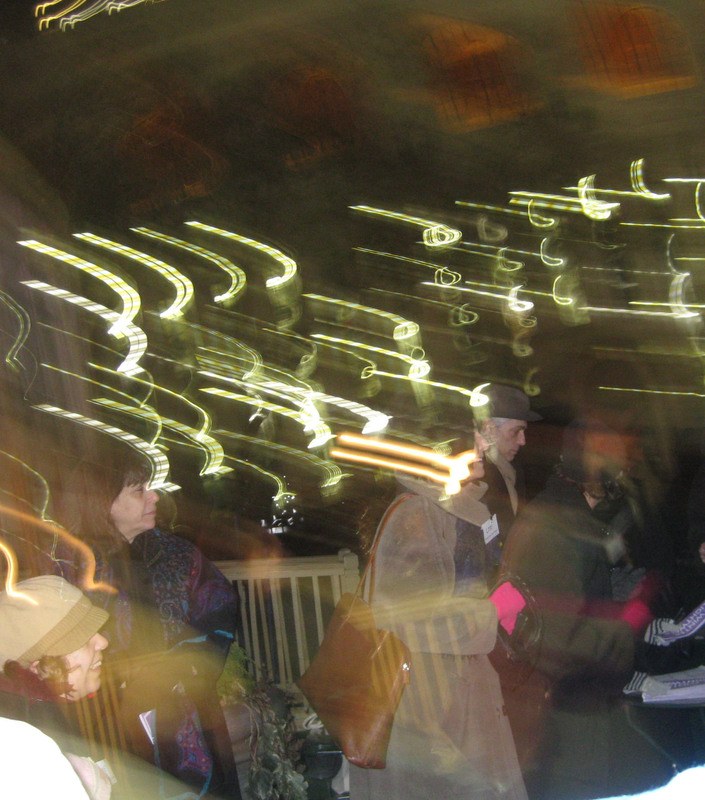 On that windy, bitter cold night gala attendees such as Leontyne Price, Lou Reed, Laurie Anderson, Tom Waits, Susan Sontag and Annie Leibovitz rushed up the Postal steps in the swirl of projected light. Little known colliding cultural facts appear on the surface of the grand building, for one, the inscription: Neither snow nor rain nor heat nor gloom of night stays these couriers from the swift completion of their appointed rounds is not an official motto of the U.S. Postal Service but an abbreviated quote from ancient Greek historian Herodotus describing Persian postal messengers. A Mr. Mitchell Kendal from McKim, Mead and White is said to have selected it for the NYC building. The inscription itself was carved by Ira Schnapp; stonecutter, engraver, and graphic designer from Austria who would later design logos and lettering at DC Comics! An aficionado of the Manhattan landscape who has written for such diverse publications as Public Art Review and New York Magazine, Mark Kramer has observed, “With possible exception of the Park Service, the Post Office is for most Americans the most beneficent face of the Federal Government”. The long lines of customers at holiday time, tax return deadlines, grant application due dates are still a zone of frenzied activity, but sadly, the once proud 24-hour Post Office has reduced its hours, Mon-Fri 7:00am-10:00pm; Sat 9:00am-9:00pm, and Sun 11:00am-7:00pm. Electronic communications have replaced the pen, paper and envelope. 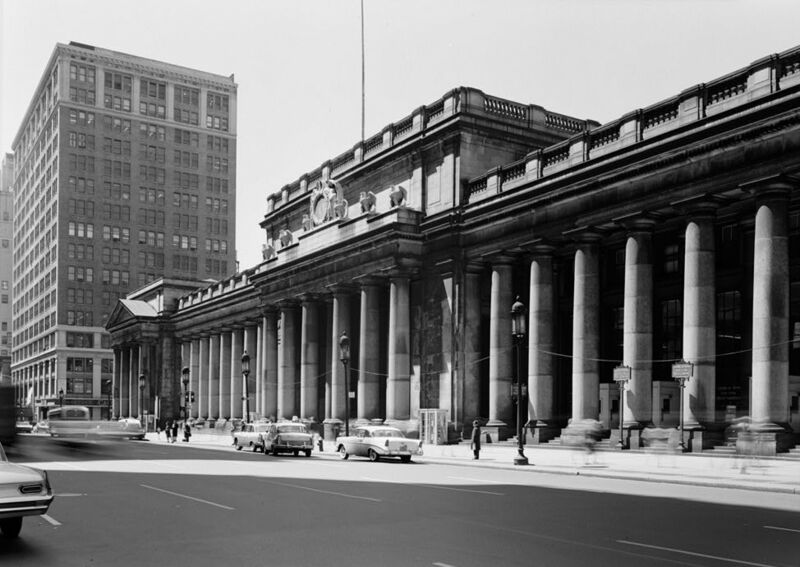 From 1910 to 1961 the Post Office mirrored the imposing Pennsylvania Station on Eighth Avenue. Now, the building is poised to shed its identity as the civic portal of written communication and fulfill the role of transportation hub. The renderings of the “New Penn Station” are eloquent, modern and airy within the confines of the old Farley P.O. The Public Dramas/Passionate Correspondents glass slides lie dormant in archival boxes, ready to adapt and re-install as a celebration of the refreshed civic facade and center of activity – Moynihan Station. Leni Schwendinger Light Projects’ recent projects win American Society of Landscape Architects awards. The park is also iconic at night time due to its dramatic and colourful lighting scheme, which also ensures greater safety. These were the final few days to visit New York City’s premier center city park in its festive decor – including our Jewel-Light Luminaire™ display on four towers surrounding the skating rink. Bryant Park was also the location of my January 12 Winter LightWalk. e-Oculus covered the event and Contract Magazine was inspired to publish an interview. And Night City, a LightWalk movie sets the night in motion. The park is "moonlit" by floodlights from a neighboring building. The streetwall perspectives are sensational. Features such as the Grill, fountain and light-edged trees enchant. We arrived on a cold, turbulently windy day. Snug and dry in the Admiral Hotel a converted waterfront warehouse, we fell asleep to the hum of wind gusts whipping down The Sound (“Øresund”) –a strait between the Kattegat and the Baltic Sea. The Admiral is a few minutes walk along the waterfront to new the Royal Playhouse – its interior filled with an atmosphere of starlight, and a view across the river to the dramatically illuminated Copenhagen Opera House. By evening’s light a walk into the center city; I wondered at the darkness – the catenary lights suspended over every street – and rare punctuations of facade and sign lighting. Center for LYS (Center for Light) invited me to speak that their annual Lighting Day. This year it was held at the ultimately modern Black Diamond – a conference and cultural center annexed to the “old Copenhagen Main Library” built in 1906. In the center of the vast, open lobby there are two conveyors that stretch between the old and the new buildings. Watch my Conveyor movie on the Light Projects YouTUBE channel (click here). The Danish Lighting Center was founded in 1948 with a mission to “advance knowledge and to disseminate information for the improvement of the lighted environment to the benefit of society”. They hold seminars and conferences, and produce a magazine, LYS. Director, Kenneth Munck and Dorte Gram, an architect who coordinated my invitation to the event and writes for the LYS Magazine, were both wonderful hosts. I joined a dynamic international group of lighting designers and engineers, including Roger Narboni from France. My topic was “Reclaiming the Dark Side of Town, an Underpass becomes a Gateway”; a comprehensive discourse on the making of Triple Bridge Gateway at NYC’s Port Authority Bus Terminal. This project took eight years to complete, with Light Projects role encompassing illumination, color palette and collaboration on the materials for four bus ramps in midtown Manhattan. Thankfully during the stay it warmed up and I wandered through the city — night and day — observing a massive population of bicyclists and pedestrians co-existing with vehicular traffic, visiting philosopher Søren Kierkegaard’s grave and exploring light and the streetscape. Mark and I visited the Rundetaarn “Round Tower” – a 17th-century tower located in the central district. It was built as an astronomical observatory and now houses a multi-use cultural space – which showcased an interesting art show of urban signs. A steep winding corridor of smooth polished cobble stones, with sunken windows and daylight effects upon stucco, leads to a ladder to the exterior observatory level and an expansive panorama of rooftops and industrial structures beyond Copenhagen proper. The 360-degree city view was exhilarating. Copenhagen is a city of Scandinavian modern and Scandinavian medieval. From the observatory to the airport, I am enthralled by this northern sensibility. Interested in other international visits and my public space and lighting observations?